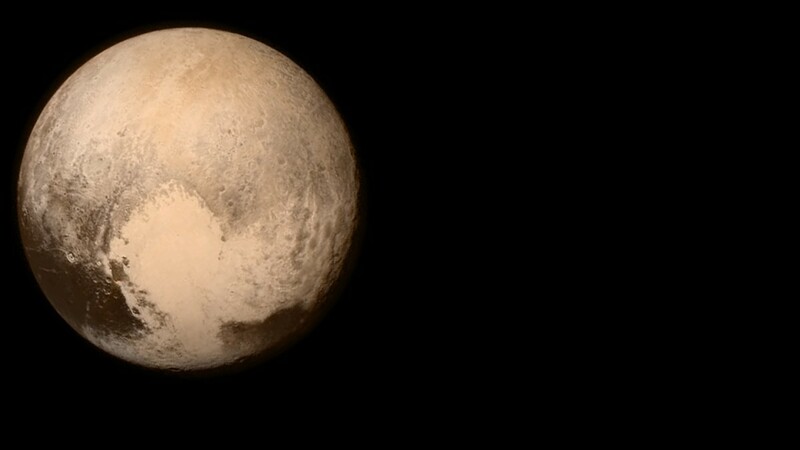 On August 24, 2006 astronomers outraged the public by declaring Pluto is no longer a planet. The official declaration by the International Astronomical Union (IAU) is still controversial, but it was the result of a growing understanding that Pluto is very different from other worlds. In its declaration the IAU defined a planet as an object which 1) orbits the Sun, 2) is massive enough to be in hydrostatic equilibrium (basically that means it’s round), and 3) has cleared the neighborhood around its orbit. Pluto doesn’t satisfy the last criteria, thus excluding it from the family of planets. Of the three criteria, the last one seems the most arbitrary, as if it was added specifically to remove Pluto’s planetary title. For example, lots of asteroids cross the path of Earth’s orbit, and yet Earth is still a planet. But Earth is much, much larger than anything else in its general orbit. Pluto shares its neighborhood with other trans-Neptunian bodies, much like Ceres shares its space with other bodies in the asteroid belt. In many ways it is easy to separate planets such as Mars or Jupiter from non-planets (or dwarf planets) like Pluto and Ceres. The latter are much smaller than planets, and share space with similar small bodies in a way that planets don’t. There’s no body that is on the fuzzy edge of being a planet. As we discover bodies around other stars, however, things are bound to become more confusing. Given that it is currently impossible to detect very small bodies orbiting a star, how could we possibly tell whether a potential exoplanet has “cleared the neighborhood around its orbit?” How much clearing would a body have to do? When astronomers are asked “Why is Pluto no longer a planet?” the bigger question strikes at the heart of what a universal definition for a planet would be. If we consider the IAU definition to be fairly reasonable, the most difficult criteria is the third one. It is particularly troublesome for planets orbiting other stars (exoplanets) where we have limited information about a potential planet. But from computer simulations we know that a planet-sized object will clear other objects from its orbit over time. The time it takes depends upon its mass (larger objects clear regions faster) and how close the object is to its star (closer objects orbit the star more quickly and have more chances to clear a region). That means clearing an orbit depends upon three things: the mass of the object, its distance from the star, and the age of the stellar system. Using these criteria we can define a threshold where an object’s orbit is considered clear. When the standard is applied to our solar system, Pluto and Ceres still don’t match the definition of a planet. They are far too small and too distant from the Sun. Things get interesting if you drop the IAU’s second criterion of needing to orbit the star. The Moon is just massive enough to meet the orbit-clearing threshold on its own, so under this new definition we could consider the Earth-Moon system to be a double planet. What’s particularly appealing about this new method is that it could be used as the only criterion for defining a planet. Anything large enough to clear its orbit within, say, 10 billion years will be in hydrostatic equilibrium, meeting the IAU’s first criterion. If we drop the first criteria to allow double planets like the Earth-Moon, then orbit clearing becomes the only real threshold a planet needs to meet. Within our solar system we also separate planets into small, terrestrial planets like Earth, and large gas planets like Jupiter and Saturn. In our solar system the dividing line is clear, since the smallest gas planet (Uranus) is more than 14 times the mass of Earth (the largest terrestrial planet). Among exoplanets that gap is filled. There exoplanets with masses of 2 to 10 Earths, and whether they are more like the jovian or terrestrial planets of our solar system remains a mystery. Right now we only know basic characteristics such as their mass and density. But that might be enough to divide them into two broad groups. 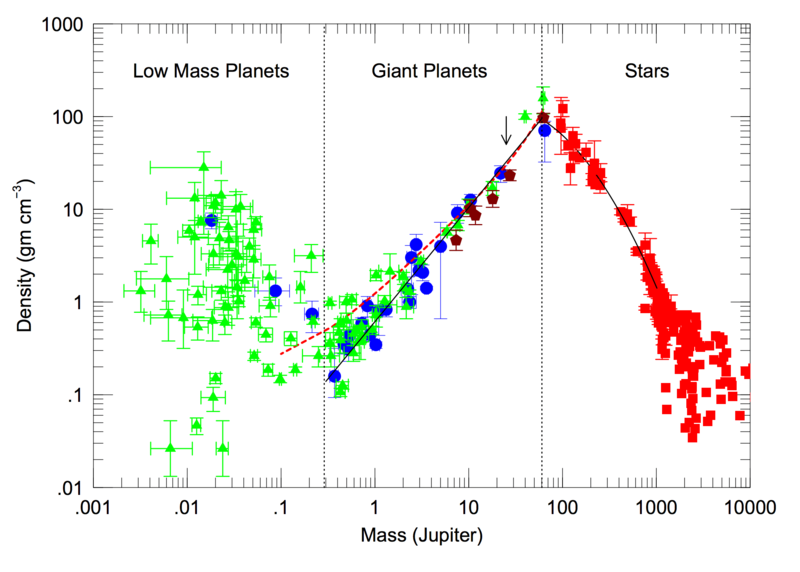 Plotting the density of known exoplanets vs. their mass, there seems to be a clear split between low mass and high mass planets. Below about 0.3 Jupiter masses (95 Earth masses) the densities vary widely. 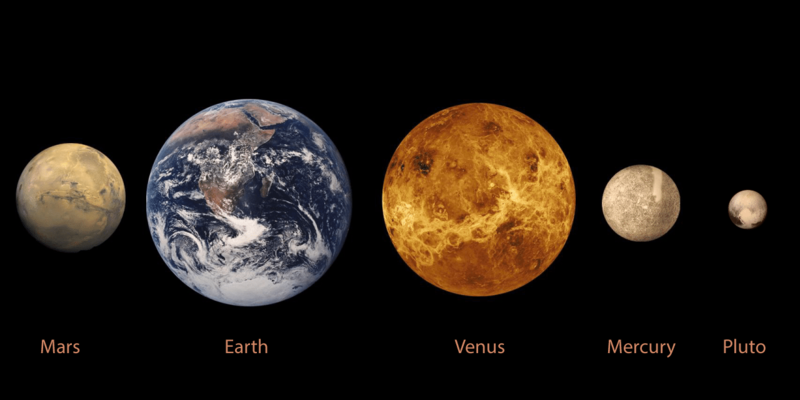 This is indicative of the fact that planets of this size can be rocky (Mars), icy (Pluto-like) or gaseous (Neptune). In this regime the composition of a planet greatly affects its density. Above 0.3 Jovian masses, the composition of a planet is dominated by hydrogen and helium, similar to Jupiter. 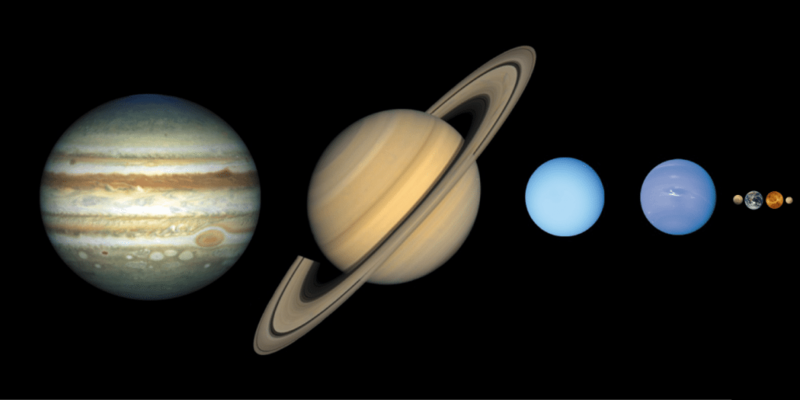 Because of the properties of hydrogen and helium, the size of these planets are all roughly that of Jupiter. The bigger the mass, the more the hydrogen and helium compress under their own weight, so the density increases with increasing mass. Around 60 Jupiter masses, the density once again starts dropping. This is due to the fact that above this mass a body has enough heat and pressure within its core to undergo fusion. As a result the body heats and expands significantly, thus decreasing its density. It would seem then that the realm of gas planets lies between 95 Earth masses and 60 Jupiter masses. Interestingly, if we apply this to our own solar system, Uranus and Neptune fall into the small, more Earth-like category, and only Jupiter and (just barely) Saturn would qualify as gas giants. While Jupiter is sometimes referred to as the king of the planets, it’s actually on the small end of gas dominated planets just as brown dwarfs. While it might seem odd that a planet like Uranus isn’t a gas planet, if it had formed closer to the Sun, its outer layers may have been stripped away early on by the Sun’s solar wind, leaving a more super-Earth like world. We’re still in the early stages of discovering and studying exoplanets. As we learn more about these remote worlds, our definition of what a planet is and is not will likely change. But even now we can see that what makes a planet a planet isn’t as clear cut as we once thought. it seems that criteria 3 (clearing the neighborhood) makes criteria 2 (hydrostatic equilibrium) necessary. Is this a correct assumption? One correction to my question :)…it should read unnecessary. Is there a reason why inclination is not considered part of the definition? 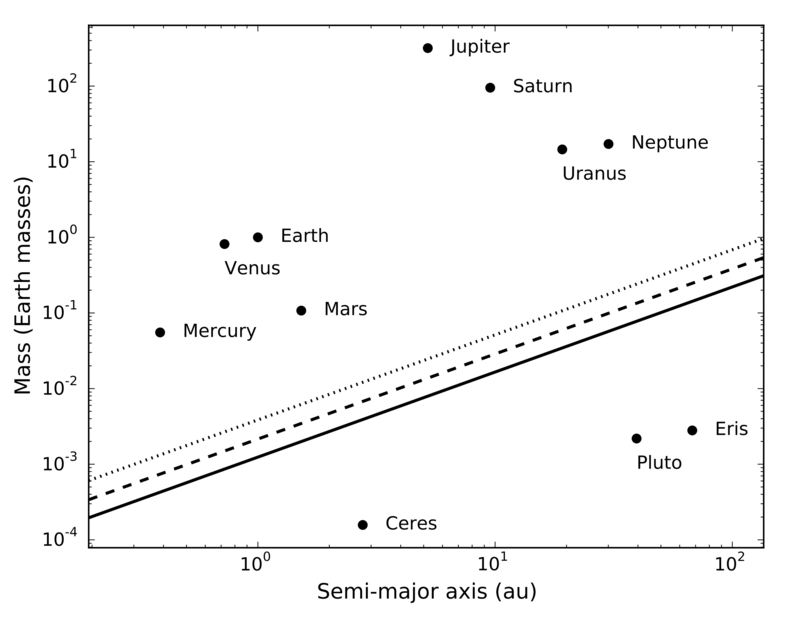 The regular planets are all within a few degrees of each other but Pluto (and Eris) are much further off the plane. The guidelines for defining a planet were drawn up as if there were no known exoplanets, although as of 2006, I think there were. More precisely, there were suspected exoplanets, but perhaps unconfirmed. Since there are now thousands of known exoplanets, the guidelines have to be reviewed. I’d be inclined to just adopt the single criterion of being in “hydrostatic equilibrium”, with some constraint on how spherical the object is. As long as the object’s mass is low enough not to begin fusion, it should be regarded as a planet. In this view, a planet doesn’t need a star, and it doesn’t need a cleared orbit. Which would make the Moon a planet, along with most of the other moons, including Charon. So now most of the planets are actually multi-planet systems and Jupiter starts looking like a mother hen. Yes. Who says a planet can’t be a moon? You can have binary planet systems but such a broad definition makes our system too complicated because the range of properties of what would be called ‘planets’ would just be too great. The whole point of scientific definitions is to make the delineation between objects clear. Hi Professor.On your post,you mention (esteroid belt).Yes.The entry of Milky Way have huge and thick esteroid spin around side by side and to the center a huge Planet.I have more to tell you,and I hope you can get this. 3. has “cleared the neighborhood” around its orbit. it so massive, it doesn’t obit the Sun but it orbit a point in-space together with the sun. Under your definition wouldn’t be a planet, since everything technically orbits not the Sun but the barycenter of system. For the IAU, they mean orbits the Sun in the traditional sense, including Jupiter. Jupiter is considered a planet, not a star, because it isn’t massive enough to generate nuclear fusion in its core.